Measuring airborne particles in the shop. The first stage of filtering the air. 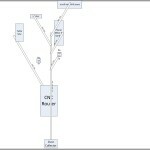 Dean’s diagram for the system. There are many exciting things happening in the shop lately including the ShopBot CNC router and dust collection system. The latter of which I will tell you about now. The dust collection system is a project that Dean is in charge of. He has been diligently staying late in the evenings to work on it, sometimes until 1:00 AM. 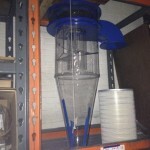 The dust collection system will be made up of a filter, blower, a Clear Vue cyclone and ducting. The ducting will be attached to the ShopBot, SawStop table saw, band saw, and other tools in the wood shop. The air will be sucked into the cyclone by the fan, which runs on a 3 phase induction, 5 horsepower motor. It will then be filtered in two stages. The first stage is the cyclone, which will filter out heavier particles into a trash can below it. The second stage will be an actual filter that will trap all the smaller particles. After that, the filtered air will be blown back into the shop. 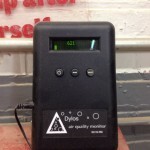 There is also a Dylos air quality monitor hooked up in the shop that keeps track of the particles in the air. It can be hooked up to a computer via an RS232 serial port for graphing purposes. Besides that, it displays the current readings on both large and small particles. The hope is that the readings will drop significantly after the dust collection system is up and running. I would like to thank Michael S. for doing the wiring for this and Dean for his many hours of labor on this project. We all hope it will make the shop much tidier and I am certain it will. Also, Dean would like help installing the ducting, which arrived today!